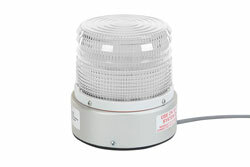 The Larson Electronics SLEDB-110V Class 1 LED Beacon works on 110/120 VAC, offers a choice of several colors and is equipped with an aluminum base. This compact, high powered LED beacon contains an LED lamp assembly that produces 360° of brilliant light without the dark spots or unevenness of traditional incandescent beacon lights. This beacon is equipped with powerful LEDs, helping to make this a Class 1 rated beacon and capable of producing a brilliant flashing pattern that is visible even in poor conditions. 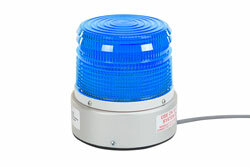 Available in a choice of red, amber, or blue colors, this strobing beacon is designed to be permanently mounted with an aluminum base predrilled with three holes for standard self tapping screws. This waterproof beacon has an aluminum base and is designed to be permanently mounted on any flat surface. A polycarbonate lens protects the LED assembly and the housing is waterproof, shock resistant and built for reliable and durable operation. This LED beacon draws 2.2 amps on 120 volts, produces a highly visible 4 joules flash, and is rated Class 1 signifying the brightest intensity possible. A simple wiring harness provides easy connection to standard 110-120 VAC power sources.